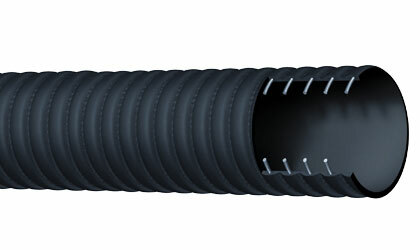 This hose is 150 PSI rated for suction and discharge applications in truck and tank car transfer of gasoline, oil and other petroleum-based products with up to 50% aromatic content. The tube is black conductive NBR and is reinforced with high tensile textile cords with flexible steel helix wire. The cover is black corrugated CR, which is abrasion, ozone, and hydrocarbon resistant. Available ID sizes are 2", 3", 4" and 6". Click here for more info.